Configurator Creation is our specialty at Applied Design Intelligence. Configurator Creation is our specialty at Applied Design Intelligence. We have been working with the incredibly powerful iLogic scripting language for over seven years now, and in that time have created some of the most powerful configurator models in the industry, most of which can be configured into millions of possible configurations. In a nutshell, a configurator is automated design –a 3D model that has intelligence applied to it via built-in coded rules. A configurator captures via rules how you, design, produce, and sell your products. If frees your designers from perpetual tweaking of existing designs to allow them to concentrate on innovation and the advancement of your product line. Stock Size Limitations – The Configurator can be designed to not allow materials to be specified in sizes that are unavailable or beyond your company’s manufacturing capacities. Weight – Product can be configured to not go over or under certain weights. Size – Rules can be added to limit both overall dimension as well as the sizes of specific elements. Overall size often drives the size of many other elements automatically. Materials – Materials can be limited to an approved library forcing standardization and simplifying material procurement. Visual Styles – The 3D models that are created by the configurator within Autodesk Inventor are visually appealing right out of the box, and can be modified to match your companies materials exactly so that you can create high quality video’s and renderings that will accurately portray the product to be built. BOM – Rules can be applied to manipulate the Bill of Materials in different ways based on the current configuration. Variable File Creation – Copies of the model can automatically be created in different formats such as STEP, DWF, IGES, DWG, etc. Estimate Generation – Generate instant, accurate estimates of any configuration based on current costs. Web Integration – Create online forms that allow customers or sales personnel to generate their own models with accompanying information such as cost estimates, etc. The sky is really the limit. Rules can be created to add intelligence to your designs in nearly any way you can think of. If you don’t see it in the list above, just contact us for more information. CAD/CAM Automation Applied Design Intelligence is an Authorized reseller of several CAD/CAM automation packages, and can create rules in your configurator to smoothly output the required information to your machinery. 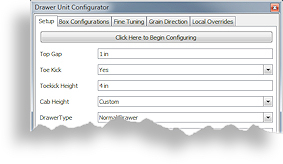 We have tried and true techniques for automating difficult tasks such as grain direction override for parts that are otherwise automatically specified in our partner nesting software.Contact us today for more information, and/or visit this configurator demonstration page to see a video that shows a configurator in action and describes its functionality in great detail. Applied Design Intelligence is an Authorized reseller of several CAD/CAM automation packages, and can create rules in your configurator to smoothly output the required information to your machinery. We have tried and true techniques for automating difficult tasks such as grain direction override for parts that are otherwise automatically specified in our partner nesting software. Contact us today for more information, and/or visit this page to see a video that shows a configurator in action and describes its functionality in great detail.